RE: Can't change Site Logo? @PitaJ It should be related to cache. My boss showed me the website and on her browser and it used the most recent upload. I tried Firefox instead of Chrome and it showed up on my Firefox as well. So it must have been because of the cache, I'll see what I can do to make it appear on Chrome, but everything should be fine. Yeah, just cleared the cache via Tools > More Tools > Clear browsing data; everything's good. I feel so dumb, thanks again everyone. @PitaJ Does this not clear it? @teh_g @julian Yes, I have reloaded via the Dashboard's reload button and I have made sure to hit the save icon at the bottom right after selecting an image file. I have tried stopping, building, and starting via UNIX as well. Although the image is uploaded to /var/www/nodebb/public/upload/system, the image that shows up on the NodeBB forum is the initial .png image that I first used. The user that I am using is the account that was first made for me when setting up NodeBB, which I'm assuming has these privileges. I don't know what I'm doing, thank you. @fasterthan That's a great question fasterthan! I have downloaded nodebb-plugin-email-domain-filter via the github url. As far as I know, it is currently still functioning. Nope, same error. My teammate suggested that I restart from scratch. I don't want to give up on it yet though, still working at it. I'm lost, I've googled, and I'm still lost. How can I get MongoDB to connect to the server again? 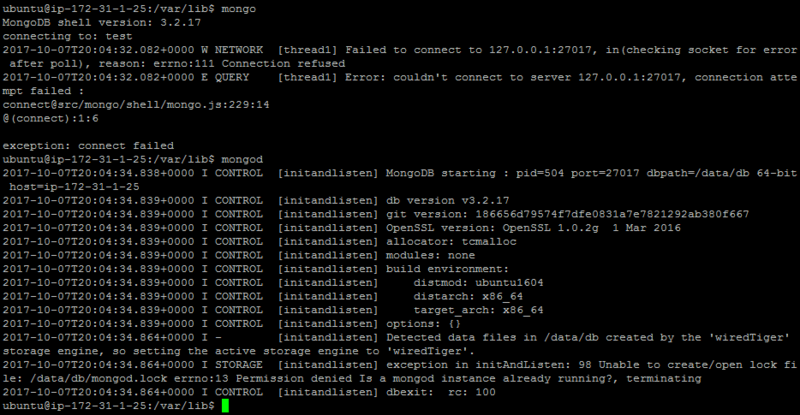 Did not know of that command, apparently I cannot connect to Mongo despite it saying it is active, I am troubleshooting right now. My NodeBB forum has stopped running, although it was up and running previously. 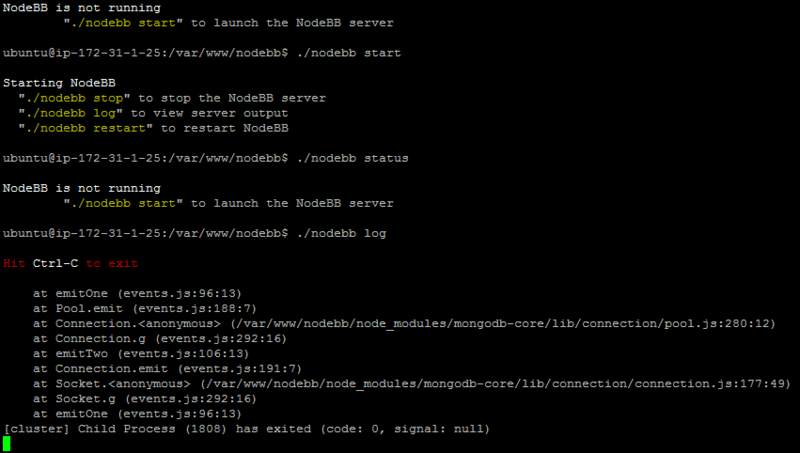 When I try to run NodeBB via '''./nodebb start''', NodeBB does not actually run. When going to the URL, I don't see NodeBB and just the default Nginx landing page. Please help, and if more information is needed, let me know. RE: ./nodebb start -> Starting NodeBB | No forum to be found? @teh_g I hadn't before. I didn't realize that we needed to set up a proxy to display the forum publically. Things are working now, thank you. For future reference: I set up a bind address and made the url the same as the bind address (including http://).